I insist that my paintings must come from personal experience. I have no desire to paint historical pictures of someone else's life. I want to communicate the emotions I feel about that particular place and time. Landscapes seem to dominate my work but I also paint animals, still life and portraits..
Jean started art classes at age 5 when her mother sent her to Saturday lessons at the Nelson Atkins Museum in Kansas City, Mo. Majoring in Fine Arts at the University of Colorado, she began painting in an abstract, nonobjective style. Signing up for a local plein air workshop taught by Mel Fillerup of Wyoming she discovered the joys of painting on location. ‘We painted every day even in a spring snow storm and I knew I had found my direction’. Since that time Jean has continued her art education with classes at the Scottsdale Artists School, workshops with many instructors including private lessons with Mark Daily in Denver. Her style of painting has evolved from abstract to a more traditional form of Impressionism working mainly in oil. Jean has painted and traveled all over the world including Indonesia, Europe and Mexico. She teaches workshops every year with several different organizations. 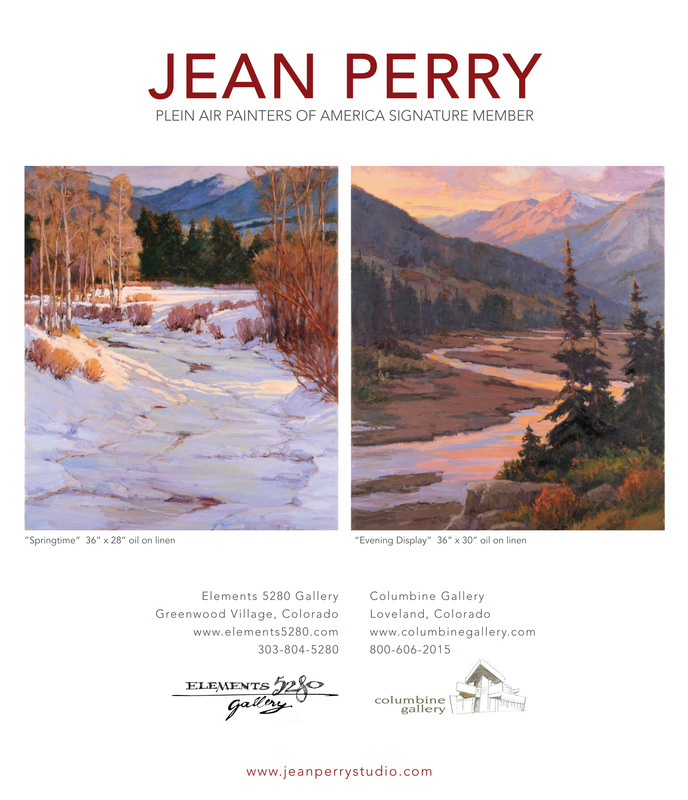 The most prestigious oil painting organizations in America have voted her a signature member including the Plein Air Painters of America, Oil Painters of America, Rocky Mountain Plein Air Painters and an honorary member of the Tucson Plein Air Painters Society. Her paintings can be found in shows from New York to California including the Arts for the Parks Top 100, The Salmagundi Club in New York City, Laguna Art Museum, Clymer Museum in Washington and the Desert Caballeros Museum in Arizona.